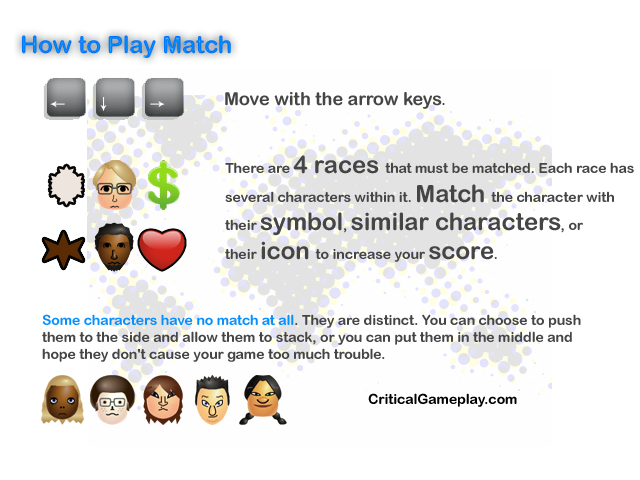 Match, the 8th game in the Critical Gameplay project, seeks to challenge the game design pattern of matching and categorizing. Players are tasked with matching objects, with people, then people with people, and finally people with a single representative object. Each time the player successfully matches, the pair is removed from the screen. Each time a player fails to match, the item is stacked. If the player stacks too many items, the game ends. There are a few catches. 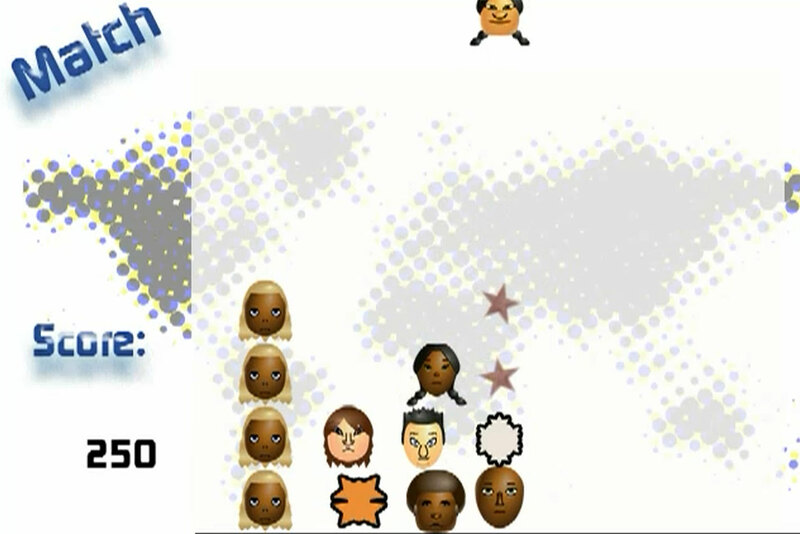 There are 4 races ( )that must be matched . Each race has several characters within it. There is another collection of characters that cannot be matched with anything else. They are not a part of the 4 races. These other characters have no match, becuase they have no pre-established stereotypes and contain a mix of characteristics from each of the other 4 races. There is nothing to be done with these characters. You can choose to push them to the side and allow them to stack, or you can put them in the middle and hope they don't cause your game too much trouble. Unlike elfs, orks, gangsters, good guys and bad guys, there are times when there is no match, and that's okay. The game was completed in 8 hours using a previous draft Critical Gameplay project on diversifying sets instead of matching. I really couldn't get that game to come together in an interesting way, but I think this game offers a bit more fodder for discussion. The concept is an execution of this common pattern - symbol to represent people, people reduced to an iconic concept (brains, soul, money, work). Where are the problems, why do we keep doing it (simply because it's easy? ), and what happens to those people who don't fit in that scheme? Match will run on most Windows XP, Vista and 7 machines.